It's never a good idea to drink and drive. Doing so while test driving a Porsche on the busy portions of 101 in wine country is an even worse idea. Apparently, that's exactly what a Santa Maria man did last week. According to a story in "The Tribune" of San Luis Obispo, Stephen Janssen was test driving a 2003 Porsche (no word if it was a 911 or not) on the southbound side of 101 near the base of the Cuesta Grade (just north of San Luis Obispo). Loosing control of the vehicle while speeding in a heavy rain, the Porsche hit the cement center wall and then careened into the other lane hitting a truck and trailer loaded with Zinfandel wine grapes. 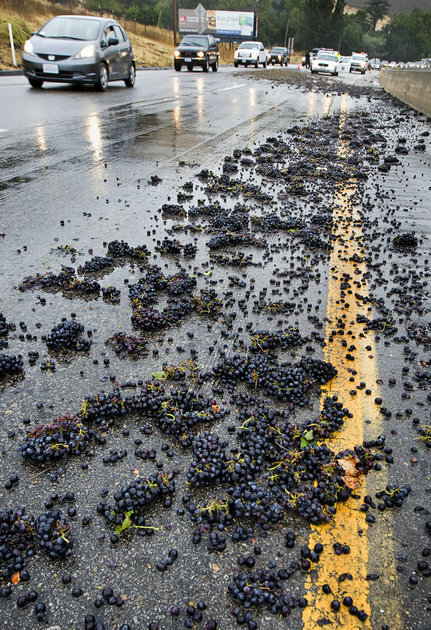 The force of impact caused two large crates of grapes, estimated to be worth $6,000, to spill into the southbound lanes, blocking traffic and creating what we can only assume was a slippery mess. It was indeed a 911…the crashed car was totaled, and subsequently sold to a local guy that plans to rebuild the car, salvage title be damned. There was another guy in the car at the time of the wreck, .he suffered a case of whip lash. The driver failed a field sobriety test, and I imagine a blood or urine test and was subsequently arrested….as we know, there are those amongst us that start drinking (Vodka, or?) early in their day. They have done it for years in many cases…they can handle their booze so that those around them are not even aware of their inebriated status. This is their way of getting through life.